It is with great sadnness that we announce that Fr Brian McGrath CSsR has returned home to the God that he loved and served so faithfully. Fr Brian died peacefully on Saturday morning, March 30th, in the Abbey Nursing Home, Blackrock, Co.Louth. Fr Brian was member of the Redemptorist community in Dundalk. May Fr Brian’s gentle soul rest in peace. Died: 30-03-2019, Abbey Nursing Home, Blackrock, Dundalk. Burial afterwards in Redemptorist plot, St. Patrick’s Cemetery, Dowdallshill, Newry Road, Dundalk. Today at noon tthe Requiem Mass for Fr Brian McGrath CSsR took place in St Joseph’s Redemptorist Church in Dundalk. We said our final Goodbyes and gave thanks for the life and ministry of Fr Brian. May his dear soul rest in the peace of Christ. Below is a short sketch of the life and ministry of Fr Brian, a much loved Redemptorist. Brian saw the light of day in Kilmallock, Co. Limerick on the 23rd March 1930. As Brian’s father, who was a bank official, had just been transferred to Youghal in Co. Cork, the whole family moved to Youghal to take up residence there. The first seventeen years of Brian’s life were spent there. Having completed his secondary education, Brian entered the Redemptorist Novitiate in Dundalk in August 1947. After his introduction to the Redemptorist way of life in the Novitiate, Brian was professed on 8th September 1948. His studies for the priesthood then began in the Redemptorist House of Studies, Cluain Mhuire, Galway. During his first years in Cluain Mhuire he studied at U.C.G. (University College, Galway), two further years were spent in coming to grips with the intricacies of Philosophy, Dogmatic Theology, Church History and other kindred subjects. In 1939 the Irish Redemptorists opened a mission Sri Lanka (then known as Ceylon) and a year later open their first foundation in Bangalore, India. By the end of World War II the Redemptorists were in a position to train young Indians who had applied to join their ranks. It was necessary then to set up structures for their training and education. So in 1946 five Irish students were sent to Bangalore to join with local men and be the nucleus of this new venture, which was to become the Redemptorist Studentate (seminary) in Bangalore. By 1953 these five had been ordained and this explains the decision to send a further three Irish students to India to augment the fledging enterprise, they were Brian McGrath, Patrick Walsh and Liam O’Connell. Here they continued their studies in theology and Sacred Scripture as well as becoming imbued with Indian life and culture. On May 26th 1956 he, another Irish student, Brian Timoney, and two Indian students were ordained in the Holy Ghost Redemptorist Church in Bangalore. A class-mate of Brian’s during his pre-ordination years was the Redemptorist Varkey Vithayathil (†2011) who was to be ordained a bishop by Pope John Paul II in 1997 and subsequently created a cardinal in 2001. A new phase in Redemptorist Mission and Apostolate now opened up before him. Preaching missions and retreats and learning to cope with the challenges and difficulties involved consumed all his energies, especially trying to master one of the many Indian languages and the never-ending train journeys, which sometimes took two to three days! Brian’s initial stint of missionary activity was quite short-lived however, as he was asked to go to our house in Chembur, Mumbai (Bombay) to take charge of a large parish school known as “Our Lady of Perpetual Succour High School”, shortened to O.L.PS. To do this, however, he would need a teaching qualification. So back to Ireland and to U.C.G. where obtained his ‘Higher Diploma in Education’. He returned to India in 1961 and was duly installed as Headmaster of the Parish School. Having, as his rector, Fr. Frank Toner was a great boon as he gave expert wisdom and guidance to Brian on many occasions. Fr. Brian recalled the eight or nine years he spent in the school as among the happiest of his life. However, all good things come to an end and in 1969 he returned to Ireland. His first of many assignments was to St. Clement’s Retreat House 1969-1972 where he spent three very challenging years. 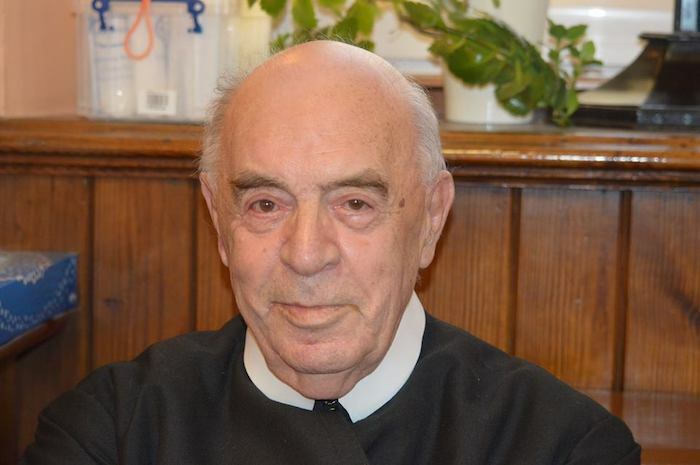 His time in St. Clement’s Retreat House (1969-1972) he recalled was a stressful one, as there was a lot of civil strife and unrest and many people had been forced to leave their homes. The retreat house proved to be a haven of security and rest for quite a lot of these refugees. Brian always admired the resilience of the people and their ability to see the funny side of life, no matter how serious their own predicament. Several other appointments quickly followed, briefly as a member of the ‘Mission Staff’ in Marianella in Dublin for two years 1972-1974. Then it was back to Belfast for the next four years 1974-1978 when he was based Clonard. For these four years he was Director of Our Lady’s Confraternity, this coincided with his appointment as Rector of Clonard Monastery for the triennium 1975-1978. Of his days in Clonard (1974-1978), he recalled many happy memories of the Ladies Confraternity. He considered the confraternity as a great force for good for the growth of the Kingdom. He was very moved by their sense of loyalty and self-sacrifice and how they would strive at all costs to be present at their monthly meetings, no matter what obstacles they had to overcome in order to be there. His next move was to Limerick where he held the post of Rector of Mt. St. Alphonsus, 1978-1984. It was during his time as rector in Limerick that the renovation of the sanctuary of the church took place. Such developments are not without controversy and this proved to be no different. The next eighteen years, 1984-2002, were spent in Dundalk, first as curate and later as administrator of St. Joseph’s Redemptorist Parish for sixteen of those years, followed by two as chaplain to Our Lady of Lourdes Hospital, Drogheda. In 2002 he was assigned as C.C. in St. Gerard’s Parish, Belfast. In 2008 he once again took up residence in Dundalk, for a couple of years he was again chaplain to Our Lady of Lourdes Hospital, Drogheda. From then on he took his part in the church and parlour apostolate of the community. For the past two years (2017-2019) Fr. Brian has had health challenges. Difficulty in walking had been the greatest obstacle, and the loss of mobility required a higher level of support than was possible to offer in the monastery. For a social character like Brian leaving the monastery and entering a nursing home was really a hardship but he made the best of the situation. Our Superior General, Fr. Joe Tobin, said in a letter to Brian on the occasion of his Golden Jubilee of Ordination in 2006: “Very important also is the fact that you have always been a good community man and a much loved confrere – so you have every reason to be full of confidence and to rejoice”. St Gerard Majella pray for him.